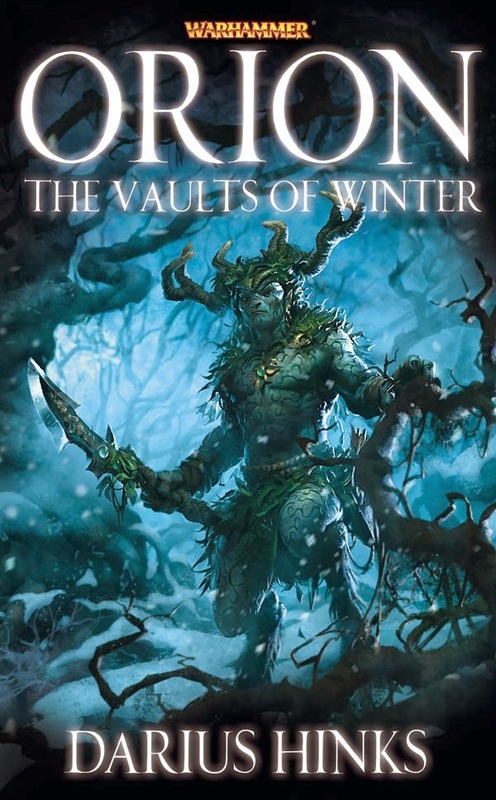 Having recently got a Ereader and rediscovered my passion for books and reading i decided to get the Black Library books Vaults of Winter and Tears of Isha, the first two books in a planned trilogy about the Wood Elf's king Orion. Now it is only natural to have doubts about how this book would, given the way that warhammer lore operates. There have been no major events in the warhammer lore for some time now. And so you have to ask if a trilogy of books, focusing on Orion, would do anything major. Let me say that for the first book the answer is no. While there are big events in this book all the consequences of these events aren't major. In order to avoid spoilers all i will say is that there is a big invasion of Athel Loren that leaves a trail of burnt forest and dead wood elves in its wake. But none of the damage done is irreparable. No the interesting parts of this book are the insights it gives into wood elf society and Orion himself. As wood elf lore hasn't been explored by black library authors there are a lot of gaps to be filled. What do you mean Orion dies at mid winter every year and then is reborn at the start of spring? What does that involve? What is Wood Elf society like? How civilized is it? These are just a few of the questions that will get answered in this book. I did have a few issues with the book. In the wood elf army book it is made clear that wood elves had a equal amount of male and female leaders, that wood elves actually prefer female leaders as they are less prone to rash actions. But all the leaders in this book were male despite that. My second issue also relates to the wood elf army book. In that book it states that wardancers are treated with respect and just a bit of weariness and fear. Yet in this book multiple wood elf highborn can be found sneering, condescending and acting incredibly arrogantly to a Wardancer kinband leader. My final issue is the attitude of the wood elf highborn. Throughout the book they acted like snooty upper class English nobles from the Napoleonic era. Anytime a "Lowborn" did anything they were offended and sneered at him/her, even though the "Lowborn" was often right. If a society thinks that gender is no barrier to leadership then why would they care if you were Low of Highborn. Aside from those issues that book is still good, it has a good plot and Orion is a surprisingly interesting character, with both flaws and a bit of character development which i didn't expect. And lets face it, this is the first new wood elf materiel published for a while. Until next time.